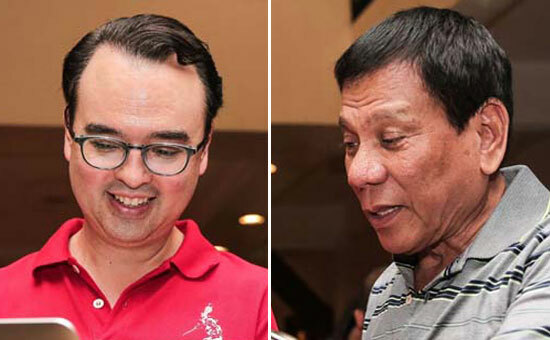 The PDP-Laban presidential bet Mayor Rodrigo Duterte and vice presidential aspirant Sen. Alan Peter Cayetano vowed to go after those "local El Chapos". The two very promising political candidates confirmed their promise once they're elected on 2016 race. The "El Chapo" term was from the name of the notorious Mexican drug lord and Sinaloa drug cartel leader Joaquin 'El Chapo' Guzman, he was recaptured last week 6-months after escaping from prison, according to Inquirer's report. Mayor Duterte told in his interview regarding to their promise to wipe out all illegal drugs problem in just 6-months if ever elected, he said, "I will not allow our country to become Asia’s Mexico. We will not become a narco-state." Then Sen. Alan Cayetano told to the reporters that he and Mayor Duterte will combine the military and police forces to caught those notorious drug lords in the Philippines. He said, "With the help of the people, we will end the reign of drug lords and make our streets safe again for our people." Do you agree with the PDP-Laban presidential and vice presidential bet promise? Share your thoughts below. Comments or suggestions about "Duterte & Cayetano: Philippines will not become Asia’s Mexico" is important to us, you may share it by using the comment box below.